Now that my login issues are sorted at last, here is my slightly ridiculous contribution. The Internet has been an extremely useful tool for expanding general knowledge about all cultures, as it is accessible to people all around the world, of all sorts of different nationalities and backgrounds. As a result of like being able to find like more easily, communities form: around similar interests, shared beliefs, and identities (to name a few). This video is called “Irish Time With Jack,” and it begins with his typical intro, a high-five and a rather boisterous, “Top o’ the mornin’ to ya, laddies!” This is characteristic of him as a YouTuber, specifically a Let’s Player. A Let’s Player, for those unfamiliar with the term, is someone who records themselves playing video games and giving commentary. It is generally considered a comedic category of entertainment, so it serves the dual purpose of being able to watch someone play a game one might take interest in while also hopefully getting a laugh. Jack (as he’s popularly known – his real name is Sean) capitalizes on the fact that he is one of the few popular Let’s Players out there (though certainly not the only) who is Irish by co-opting the stereotypical “top o’ the mornin’ to ya” greeting that is so familiarly and stereotypically Irish, usually associated with leprechauns or any similar stereotypes those of us non-Irish exposed to media representations of Irish people would be familiar with. 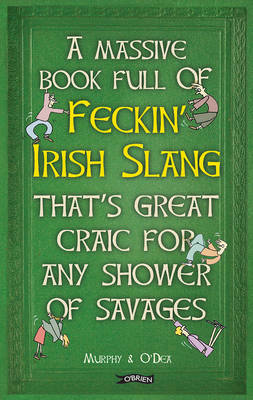 The rest of the video entails Jack going through this book and describing various Irish slang terms such as “gas,” “howiya,” “how’s she cuttin’,” “craic,” “the black stuff,” and so on. Jack inserts various personal asides into the video as he remembers them and notes that he hasn’t heard some of these words in a long time. A lot of the Yeats we dealt with recently concerned Irish identity, and as I said before, Yeats would be likely rolling in his grave if he knew a video like this existed, or that the contemporary Irish behave this way. And yet, Jack not only makes Irish culture (specifically dialectical differences) into something one can learn, but he presents it as important knowledge. He is sharing an Irish perspective on Irish culture. One could say that he’s possibly trying to justify his own Irish heritage in the face of those who have disputed his nationality, but I prefer to look at it from a lighter perspective than that. Though Jack is clearly parodying the doubt and criticism about his nationality by capitalizing on numerous Irish stereotypes (the Irish are always drinking, they’re descended from potatoes, they spend most of their time insulting each other), he does so playfully, and he lets his audience in on the joke, so to speak. He makes Irishness inclusive instead of exclusive and provides a way, however joking, to access Irish culture in a more natural and far less scholarly way than Pearse, for example, might have wanted. The silent, judgmental stare of a dead Irish revolutionary. Instead of instructing his audience in Gaelic, Jack takes a more practical approach: “If you just wanna hang around Ireland, and you just wanna see what the place is all like, […] and then you come in to […] the C’mon Inn, and then you’re just like, ‘ah, Jaysus, ah Jaysus gimme a pint there now, Peter, will ya? Good man yerself, what is it, forty euro? Jaysus, pints are gone up a lot…’ See what I mean? You just work it into your language like that and it just comes out naturally.” He is making Ireland itself accessible to those unfamiliar with the dialect or the language. Of course, this is also largely comedic, as there’s just as high of a likelihood that any Irish person would laugh themselves silly at a foreigner trying to sound too Irish. I think a lot can be conveyed in comedy, though, and I think this video, in all the fun it pokes at itself, is an interesting representation of how Irish perspectives of Irish identity have evolved since Yeats’ time. Obviously, one Irish YouTuber does not speak for the Irish people as a whole by any means. This video certainly isn’t a reliable source for learning how to actually be Irish, if that is something you can learn to begin with. However, it does explore Irish identity in a contemporary context, particularly regarding how it is viewed externally versus how it is viewed internally (i.e. Jack’s non-Irish viewers’ perspectives vs. Jack’s perspective as an Irish citizen) and where these viewpoints cross, collide, or complement each other. Padraic Pearse might not be satisfied with exactly how Jack goes about trying to teach people to be Irish, but he might be satisfied with the fact that Ireland is free enough and its people confident enough in their heritage that a video like this can be produced. There is something more profound in this than I can put my finger on, but mostly I just thought the video was hilarious and interestingly relevant to our exploration of Celtic identity, particularly through language. Perhaps someone else can provide further insight using the words I can’t find. JackSepticEye. “Irish Time With Jack.” Online video clip. YouTube. Google, 16 October 2016. Web. This entry was posted in 2016-17 by Levi. Bookmark the permalink. And here is how to tell a Scottish accent from an Irish one… and then some thoughts on breakfast and other subjects, from the fantastic Danny. Bhoy, a Scot of South Asian descent (on his father’s side). Because identity politics never cease to be interesting.